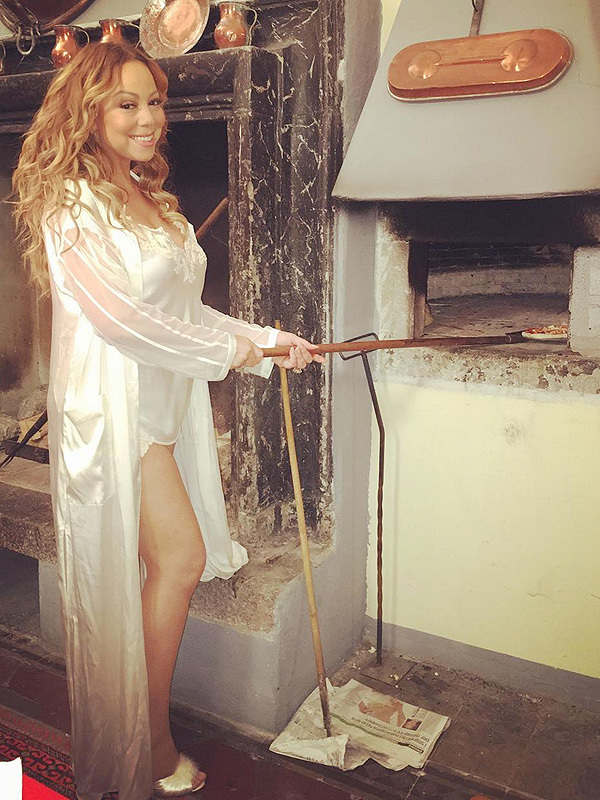 Why wouldn’t Mariah Carey make pizza while looking this fabulous? While on her “Sweet Sweet Fantasy” tour in Italy, the singer whipped up some brick oven pizza in a white silk cami and shorts set, floor-length kimono and matching fuzzy heels. “Making #pizza,” Carey captioned the snap of herself preparing the pie on Sunday along with a few cheeky emojis. To compliment her posh pajamas, the diva wore her golden locks in loose curls. The “Infinity” singer—who was also recently treated to a “surprise visit” from her billionaire fiancé James Packer while overseas—had some help in the kitchen from her four-year-old twins. “Miss Monroe,” she captioned the photo of her daughter rolling out the pizza dough, while Morroccan tends to the pepperoni and cheese toppings. In another photo taken from their gorgeous $12,250 per night Italian villa, Monroe adorable poses in her mom’s thigh-high black boots. The eight bedroom estate—which the family stayed at courtesy of Airbnb—features picturesque views of Lake Como, eleven working fountains, a home theater and playground for the kids. This isn’t Carey’s first run in the kitchen looking so flawless. Last year, Carey shared a photo of her homemade gluten-free lasagna (while wearing chandelier diamond earrings and bangles, naturally). She also showed off her Frito pie making skills in a Funny or Die video “Cooking with Mariah Carey (and Also with Bryan).” If you haven’t already seen it, you’re missing out.